I went to the premiere of HP7 yesterday and what can I say? I loved it. In my not-so-humble opinion it’s the best of the movies so far. All the isolation and tension of the book was there. We’re very far away from a children’s story, as we should be, if faithfulness to the increasing darkness of the books is to be kept. I’m sure there will be a lot of talk about the “dance in the tent” scene, and many will be against it, but I found it precious. Yes, it’s not in the book but it just felt right. I’ll need to download that song from iTunes (it’s Nick Cave’s O Children – I bet it’ll become a top-seller in days!). And talking about magical worlds, I’ll move on the Fables. A friend who’s a big graphic-novels fan came to visit and we took him a tour of the specialized shops, which are many and good around here. I asked him for a recommendation and he directed me to Bill Willingham’s Fables series. Similar to A League of Extraordinary Gentlemen, Legends in Exile (the first book) is full of more or less obscure references to fairy tales, so how could I not love it? The Fairy Tale world has been taken over by a still-unknown evil force and fortunately some inhabitants were able to seek exile in our own world. Here they’ve infiltrated our society and live an apparently common life. However, they have their own Government, led by Snow White (who became a very competent bureaucrat), and their own laws. This first story follows S. White and B. Wolf in their attempt to discover who killed Snow’s sister, Rose Red. Rose’s boyfriend is the same Jack who climbed the bean stalk, while her former fiancé is Blue Beard. The book as many moments of great tongue-in-cheek humor, most of it involving Snow’s previous husband and incorrigible womanizer Prince Charming, but in the end it’s a very cynical look at what happens after the Happily Ever After: former prices are broke, characters who aren’t human are doubly exiled in an isolated farm, and everyone seems in general not to be very happy with their current situation. 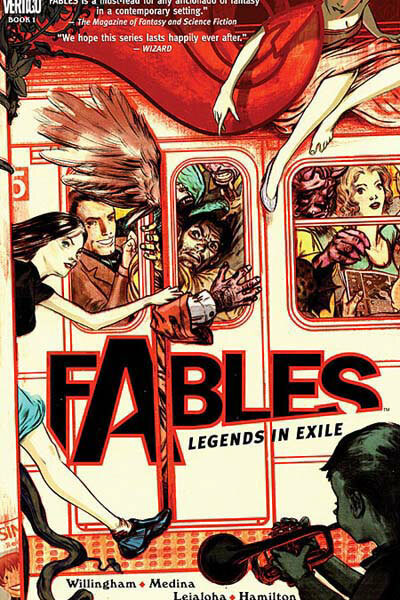 Visually, Fables is similar to other DC/Marvel comics, full of muscular men and voluptuous, red-lipped, perfectly-eyebrowed women, dressed in clingy clothes. I usually have to make an effort to get past this, and suspect it has a lot to do with why most women are a bit put off by traditional comics. I even mentioned it to my friend and he replied “But they’re not human! They never grown fat or old!”. Don’t they? Ok, fair enough, it’s a good argument and it helps me deal better with how unrealistic they all look.